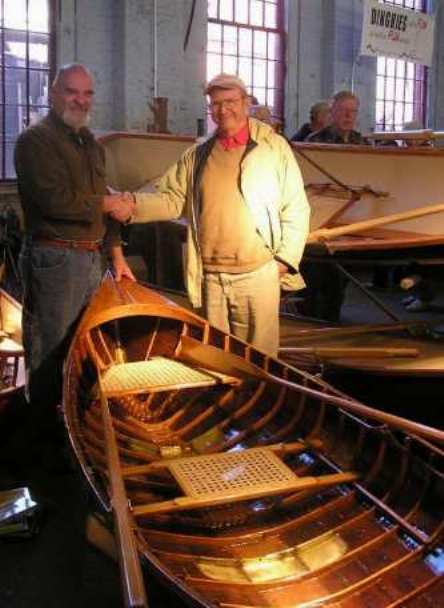 Over the years we’ve sold boats to and made connections with a variety of well-known people. So, we thought we’d share some of our stories with you. 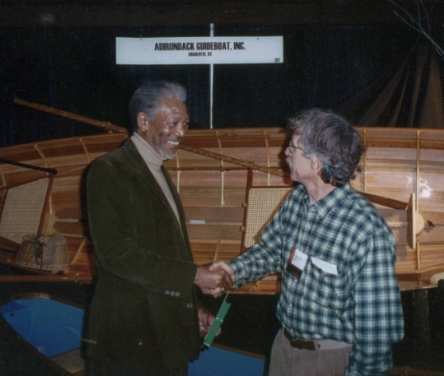 We didn’t actually sell a boat to Morgan Freeman, but this is such a cute story we couldn’t hold back. We had our boats at a craft show put on by the Philadelphia Museum of Art….it is one of America’s premier craft events…. merely being accepted to the show is a huge feather any craftsperson is proud to stick in their hat. So, we said our goodbye and shook hands all around. Morgan and Steve posed for a picture. 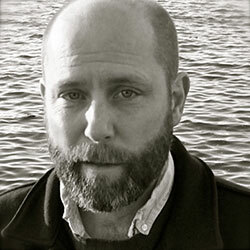 Brian Rooney is frequently seen on ABC’s nightly news as their Los Angeles correspondent. Brian has climbed a 180-foot redwood tree to interview a tree-sitter; he covered the tsunamis in Thailand and Indonesia, the uprising in Baghdad, wild-fires and earthquakes in California and the bombing in Oklahoma City. One afternoon Brian and his friend, Al Freihofer, stopped in at our shop. 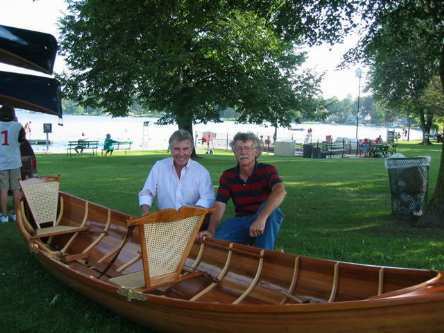 They admired our boats and hoped one day to be able to get one. We promised and wrote up the order. As the delivery date neared, many phone calls went back and forth, just to make sure all the stars were aligned and that everything was going to happen as planned. For perhaps two full minutes, Brian did not react. It was such a fantasy that he couldn’t believe it was coming true. This is a photo of David and Brian…..Brian holding a plaque with all the names on it of those who contributed to his present. 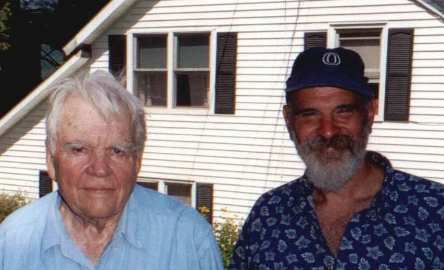 And this is a photo of David and Brian’s dad, Andy Rooney. 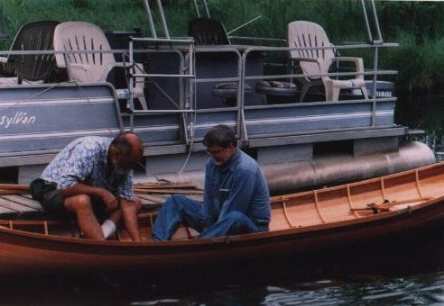 This is David giving John rowing instructions in his new boat. Steve said, “Sure,” and that was that. We could hardly believe what was happening. It was only when that last check was written that we accepted the fact, yes, we really did sell three boats at the same time. Mr. Rockefeller shook his head, no. Mr. Rockefeller took David up to the attic and, sitting there on the floor was an absolutely beautiful….but horribly neglected and horribly repaired…. 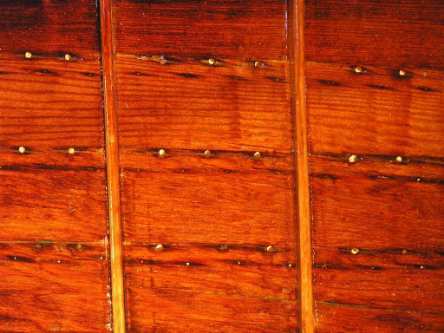 cedar guideboat. It was so small it was almost the size one would build for a child…..which it was. Mr. Rockefeller’s grandfather had it built for his daughter, Mr. Rockefeller’s mother, in 1908. 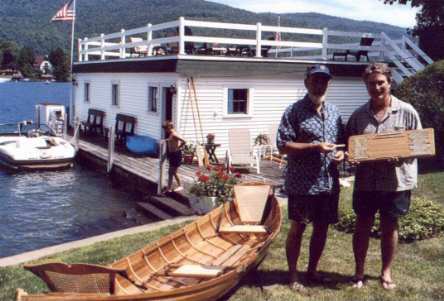 Mr. Rockefeller asked if he thought we could restore the boat. “Yes,” David said, he thought we could. 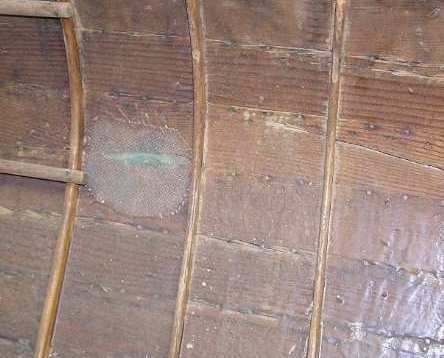 These photos show the before and after repairs of the same portion of the boat. One last note….Mr. Rockefeller was right…. he did have a project in which David was interested. John and his family stopped into our booth at the New York National Boat Show. David asked if his little girl might like to take a ride in a boat, she nodded, yes, she would… and Dad and Dave played with the little girl in the boat for perhaps a half hour. David Hellawell is the Head Coach of the British National Canoe Team. He drove past our shop on a vacation in America, saw a familiar shape in the yard, hit the brakes and made a U-turn. We spent an hour at the shop, talking boats… and then a couple of hours out on the water, rowing boats. 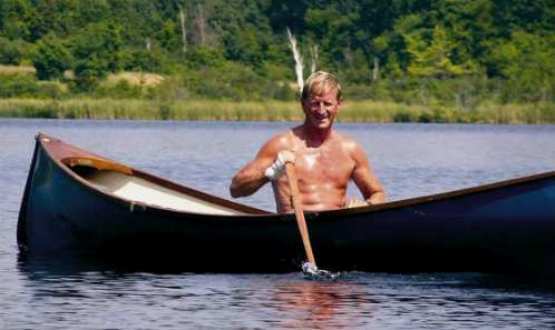 David has an amazing set of boating experiences and he was delighted to add a new style boat to his vocabulary. Bob Sullivan is an editor at Vogue. He is one of the most interesting and entertaining people we’ve ever met… (how he got to be an editor at Vogue, we don’t know. How he got his article on our boats published in Vogue… well, that’s also a mystery. 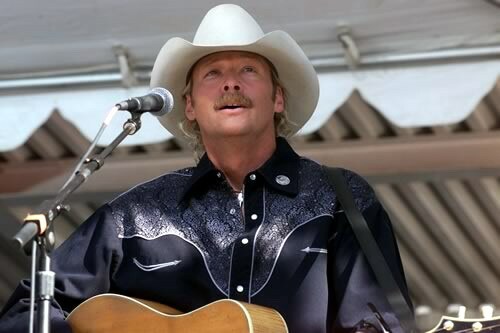 When last we heard from Bob, it was on NPR’s Fresh Air with Terri Gross. They were having their 25th anniversary program week and, as part of the celebration, each of the program’s producers selected his or her favorite segment. The guest on one of those most-favorite-segments was Bob Sullivan.